My class is always way too noisy during centers. I just don't understand how to schedule centers. 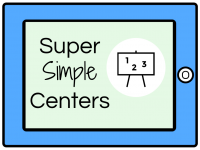 How do I rotate/group students/hold them accountable/plan/find centers/take grades/not lose my sanity? I just don't have time to figure it all out plus plan my guided reading groups. I needed to start like yesterday! Yes, place me on the waitlist.